This mouth-watering recipe from Kevin is quick and easy to make. Perfect for a summers day this dish can be served as a main course or a small starter. Try this preparation as an appetizer with just bread and radishes. Finely chop the red peppers and stir fry for a moment or two with the finely diced red chilli. Set these aside and allow to cool. Meanwhile half the tomatoes, chop the onions and garlic and add these to the red pepper and chilli mixture. 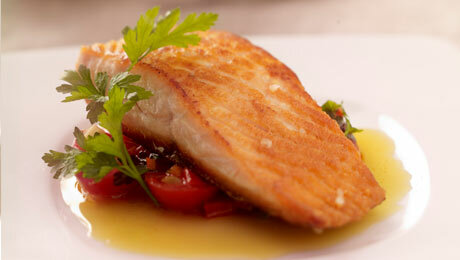 Heat a large frying pan with the oil and add the salmon flesh side down and cook for 3-4 minutes on either side. Allow to rest or if the salmon is thick you can pop it into the oven for 5 minutes to ensure it is fully cooked through to the centre. Serve with some of the tomato and chilli salsa and a little green salad.